The Waitrose John Lewis Partnership is widely acknowledged as one of the UK’s most successful and respected retail groups. They are a market leader in the premium sector with more than 400 stores and serving of millions of customers every week. As a business, the Partnership's shops and branches are focussed on the overall customer experience. Their building and energy management initiatives, devised over the John Lewis Partnership estate which includes 357 Waitrose branches and 38 John Lewis stores, have always placed this and partners' engagement as the key foundation of the Partnership's sustainability strategy. 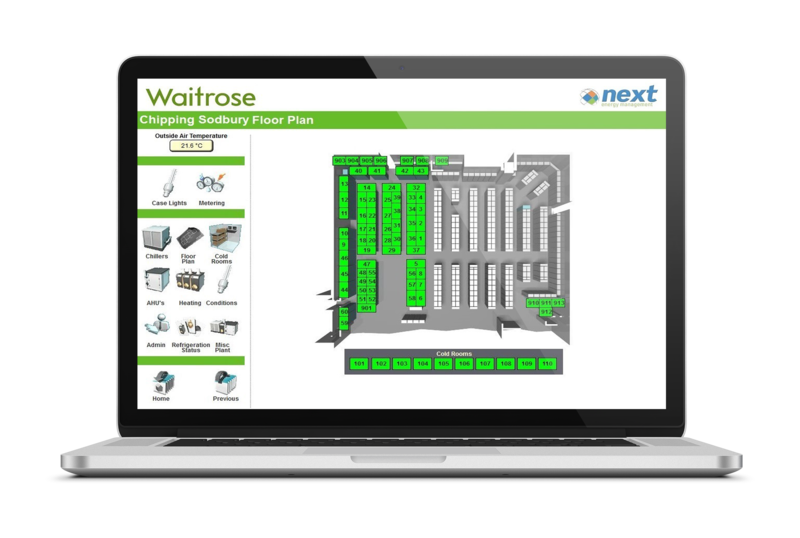 Prior to 2000, Next Control Systems were simply monitoring buildings for selected locations within the Waitrose estate, and performance data was provided by way of regular printed reports and ad hoc spreadsheets post event. In 2001, remote connectivity to each building was achieved via 56k dial up modem. This enabled two way communication between Next Controls Remote Support Centre and each site, integrating monitoring and remote intervention across all building services including HVAC, Lighting, Refrigeration and Energy Monitoring. 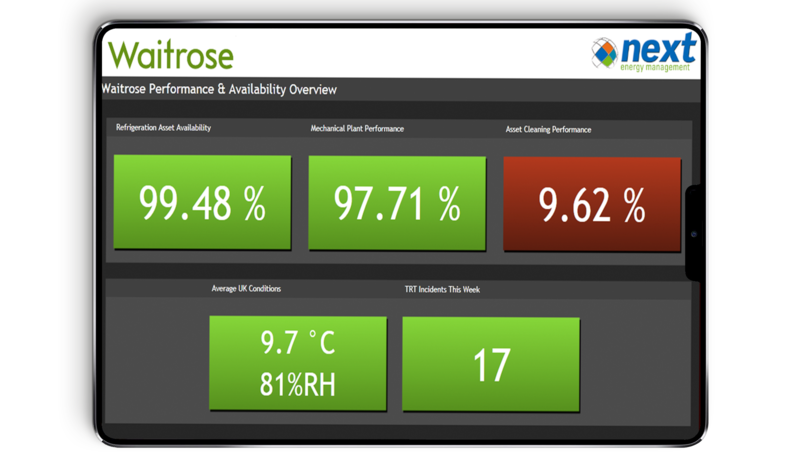 The monitoring of individual plant performance emerged as a key management tool for contractors and JLP engineers and facilitated real time ‘availability’ measurement to be introduced for all refrigerated cases. In 2005, JLP made a major investment in cloud and IP technology for EPOS and IT systems, to improve their market competitiveness. This commercially-driven decision provided the perfect platform to facilitate alarming and monitoring in real time and inspired the joint development of a genuinely innovative retail energy management programme by Next Controls Systems and JLP Engineering team. Stores were upgraded one by one across the estate empowering a level of benchmarking never possible before including site by site comparison, plant, manufacturer and service provider performance was all tracked and analysed to create improvement and savings. In an initiative designed to eliminate store led deviations from the estate standards, all site based PCs were removed and a technology independent, web based graphical user interface was implemented by Next Control Systems. The ability to change performance parameters was limited to certain key engineering personnel and all stores revert to the estates standard at 2am every morning. This eliminates operational and energy performance drift. As a by product, this move freed up IT resources and removed the need for expensive and time-consuming backups, software version control or anti-virus software. 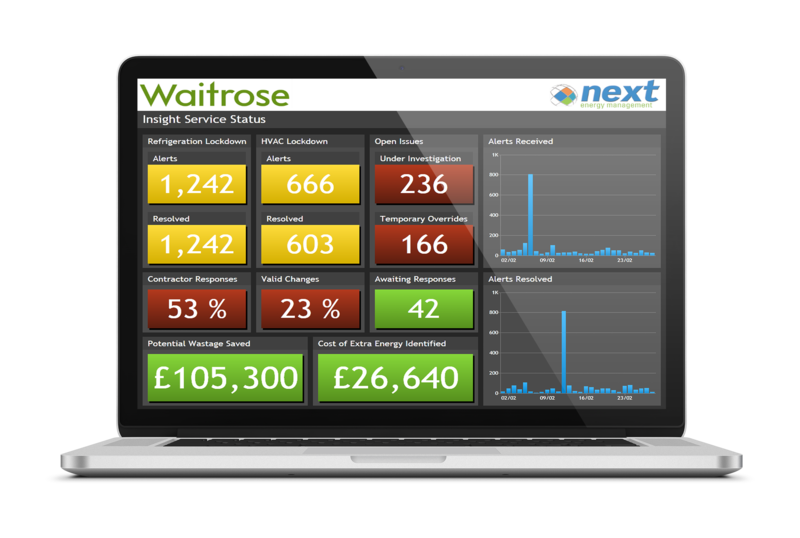 In 2013, with the whole Waitrose and John Lewis property portfolio covered by real-time monitoring and alarming, the drive was to create a proactive store management platform with the same level of granularity as business retail metrics and integrated into a single pool of meaningful actionable management information. The platform was to monitor asset performance continuously and to segment activities and functions at estate, region, and store level. The monitoring and alarming of refrigeration systems is a significant factor in measuring case ‘availability’ in store. This is a key performance indicator that affects both customer satisfaction as a well as store level margins as if a refrigerated case is unavailable, this limits the product stock available for purchase, reducing consumer choice and impacting revenue streams. The platform was able to analyse potential issues, model and recommend solutions, based on identified weaknesses, ahead of costs being incurred. Now with a single addressable data set spanning the whole customer-facing retail environment, from buildings, plant and merchandising, retail and energy management were able to make informed decisions that reduced costs, increased margins and maintained or even improved the customer experience. This approach explains The Partnerships high level of market performance when other large retailers have been under increasing pressure over the past five years. 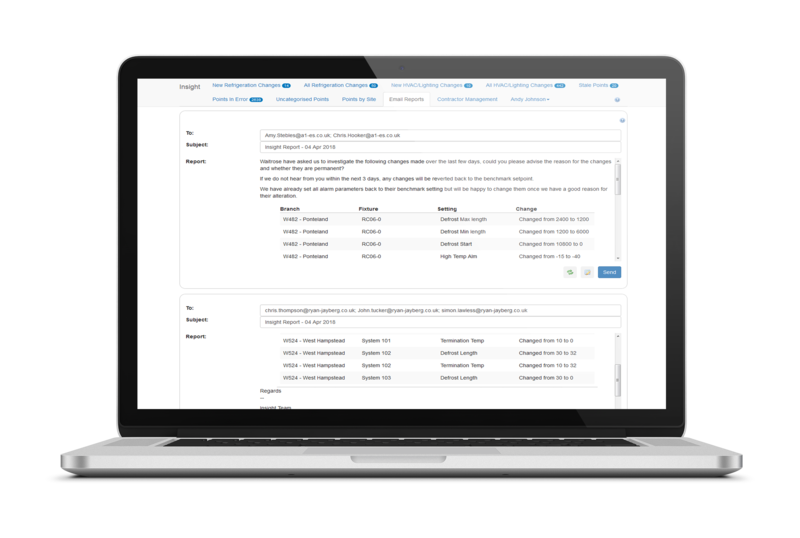 Instead of harvesting data and having it analysed by the provider and presented as a report and/or spreadsheet, Next Controls have developed a suite of web based dashboards that allow managers, at a wide variety of function and seniority, to view performance at multiple levels in real time. 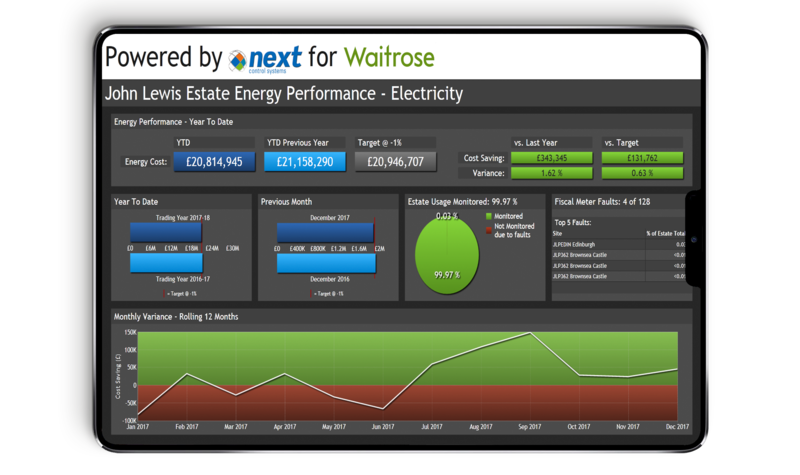 These performance dashboards show the estate performance in real time including case availability, environmental conditions, energy profiles and key specialist contractor performance. The platform empowers JLP management with the most detailed profile of the retail environment even seen. 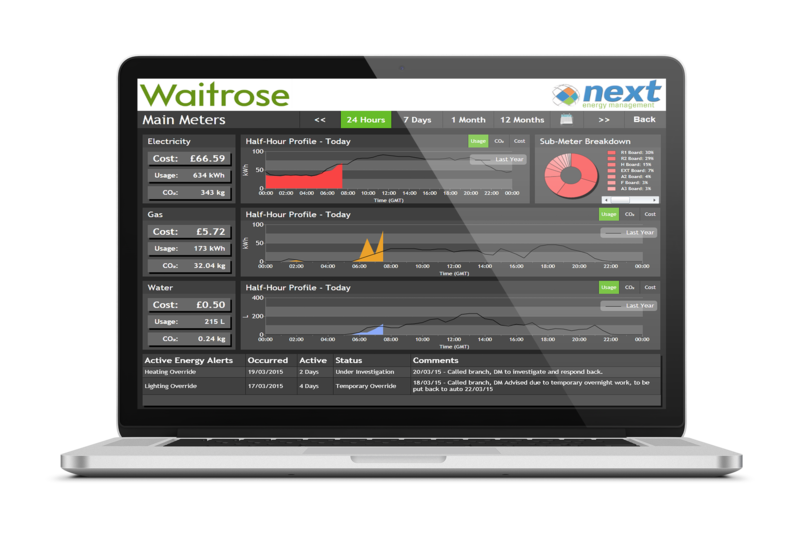 “Next Control Systems have supported Waitrose and John Lewis for the past 25 years by ensuring our refrigeration equipment and buildings are monitored and managed efficiently. The Next Control Systems 24hour Remote Bureau, Technical Response Team and intuitive Dashboards provide our Branch Partners, Central Maintenance Teams and Servicing Contractors the information they need to ensure that the refrigeration equipment is at its maximum availability. "We have worked continually with Next Controls over the last 15 years in a number of varying roles. They have always provided insightful and solutions driven outcomes for all their clients maintaining at all times a real ‘can do’ attitude. Their ability to attract and retain knowledgeable staff is a real strength and they always seem to have their clients best interests front and centre of all their activity. I would have pleasure in recommending Next Controls to any business that needs support with the management and optimisation of their facilities."